lakebeachville9000, originally uploaded by pretty.kittens. 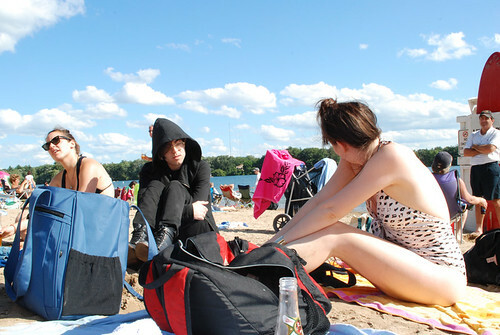 So you're on a beach on lovely sunny day, surrounded by pretty ladies. Do you strip off to show your scrawny yet intellectual physique? Do you buggery! You sit there covered in as much black as possible to guarantee the Daystar doesn't infect you with it's joyful rays, discussing your latest epic poem documenting your Saturday job at Hot Topic. This is quite above and beyond the call of Chthulu duty. Top marks! This should be the new Website banner photo! Surely that should be DEAD-ication...? Love the site, keep 'em coming. I agree, I think this is my new favorite one too. Definitely a keeper. This pic reminds me of "Mystic Pizza!" Cool movie if not gothic.